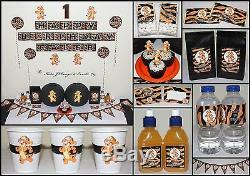 The'Tigger' Party Theme is an Adorable Design PERSONALISED with your Childs Name & Age. It can also be Styled for a Baby Shower with the Mum to Be's Name. Personalised Party Decorations are both WATER-PROOF and FADE-PROOF for 3 years. A High Quality Professional Print - up to 1440DPI. Products are printed on either Adhesive Vinyl or Polypropylene Film, which is similar in texture to Photo Paper. Please read the Detailed Product Descriptions below for more information. · 4 x Decorated Paper Lanterns. · 24 x Party Cup Stickers (or Pop Top Juice Labels Upon Request). · 12 x Party Cup Stickers (or Pop Top Juice Labels upon request). Please Send me a Message with the Celebrants Name & Age at Checkout. Personalisation is ONLY for the Particulars pictured i. It is not for your Own Personal Message/Custom text. Please make sure you read the Detailed Product Item Descriptions at the Bottom of this Page. Products are PROFESSIONALLY HANDMADE they are not Commercial products. My Office Hours are Monday to Friday between 8am and 4pm AEST. I DO NOT WORK ON WEEKENDS OR NIGHTS. I will do my best to respond to your Enquiry as soon as practical between these hours. I DO NOT WORK ON WEEKENDS. It will be Posted using Registered Post or Parcel Post depending on the size of your Order. Please see the Australia Post website for more information. These charges are the Buyers Responsibility. If there was an Error on my behalf, please send me a message and I will organise to have your Order replaced as a priority. I try to be as accurate as possible in my Item descriptions. If you feel there is a discrepancy between what you received and what was stated in the listing, please contact me before leaving feedback and I will try to come to a reasonable solution. Party Wall Displays Feature a Custom Name up to 10 Characters & matching Balloon Decals. Wall Displays are printed on Polypropylene, a Durable Synthetic Film which is Both WATER-PROOF & FADE-PROOF for 3 years. It is NOT ADHESIVE and come in INDIVIDUALLY CUT PIECES ready for hanging with blu-tak or double sided tape depending on your surface. Curled Ribbons are included and need to be attached to the balloon decals using sticky tape or blu-tak. Each Letter piece of the Wall Display is approx. The Displays as I hang them in the Photos are approx. 1.3m x 1.5m. This all depends on how close together you hang them. I've seen Customers hang the Displays length-ways along gutters and patios too and they've also looked quite nice. Decorated Paper Lanterns come in a Pack of 4 and in a large range of colours. Image Decals are printed on High Resolution Photo Vinyl. Satin Ribbon is included for hanging and is approx 65cm in length. Paper Lanterns are posted flat and need to have wire inserted. Ribbons need to be attached for hanging & Sticker decals need to be applied to the Lanterns. Super Glue is included to secure Vinyl Decal to Lantern. Pennant Banners are the Triangle/Flag style Banners pictured and are approx. 2.5m in length including Ribbon; Flag length is approx. There are 12 x Flags in each Banner measuring approx. 19cm in Height & 14cm wide. Pennant Banners are printed on Polypropylene, a Durable Synthetic Film which is Both WATER-PROOF & FADE-PROOF for 3 years. The Pennant Banner features a Repeated Image on each Flag, in most themes this will be Age. It has been Hot glued together with Beautiful Satin Ribbon. Product Details are specified above. The Custom Name option features text of up to 12 x Characters in length. The Text is centred on the Pennant Banner and a Letter printed in each Flag/Triangle. A3/A4 Posters Are Personalised as Pictured usually with the Celebrants Name & Age. They are printed on Polypropylene, a Durable Synthetic Film which is Both WATER-PROOF & FADE-PROOF for 3 years. 21 x 29.7cm and A3 posters are approx. Party Bags come in Packs of 12 & 24 and are approx. 25cm tall x 13.5cm wide. They are made from High Quality Gloss Paper and come in a wide range of colours. Personalised Decals are printed on High Resolution Sticker Vinyl and need to be applied to the Party Bags. (Bags Come Empty No Loot Included). Place Cards come in a Pack of 12 or 24 and can be used as Food Tags or Name Cards. They are Personalised on one side with your Party details and Blank on the Other side for you to write text. They are Posted Flat and need to be folded in half to achieve the tent-style which is pictured. Invites come in Packs of 12 or 24 and are printed on Polypropylene, a Durable Synthetic Film which is Both WATER-PROOF & FADE-PROOF for 3 years. Each Invite has a Small Magnet on the back so that they can be hung on the fridge. Invites are personalised with your Party details so you will need to provide these after you place an order. I need the Persons Name & Age, the Date, Time & Address of the Party as well as the RSVP Date, Name & Contact Number. Invites are not addressed to the Recipient. There is space on the back to do so and they can be posted like a Postcard if you please. Party Cup Stickers come in Packs of 12 & 24 and are printed on High Resolution Sticker Vinyl. Simply Peel and Stick on Party Cups of your choice. Stickers have been designed to fit 200ml Plastic/Disposable Cups. I would recommend sitting the cups inside of each other for a few hours after putting the stickers on to prevent lifting. (Stickers Only No Cups Included). Pop Top Labels come in Packs of 12 & 24 and are printed on High Resolution Sticker Vinyl. Simply Peel and Stick on Pop Top Juice Drinks of your choice. 4.7cm (w) x 5.5cm (h). (Stickers Only No Pop Tops Included). Water Bottle Labels come in Packs of 12 and for use on 350ml & 600ml Water Bottles. They are printed on High Resolution Sticker Vinyl. Simply Peel and Stick on Water Bottles of your choice. (Stickers Only No Water Bottles Included). Wine Bottle Labels come in Packs of 6 & 12 and are printed on High Resolution Sticker Vinyl. Simply Peel and Stick on Wine Bottles of your choice. 14cm (h) x 10cm (w). (Stickers Only No Wine Bottles Included). Chocolate Wrappers come in Packs of 12 & 24 and are printed on High Resolution Sticker Vinyl. Simply Peel and Stick on Chocolates of your choice. They are designed to fit the Cadbury Furry Friends 15g, Aldi Choceur 40g and Lindt 35g Choc Bars. (Stickers Only No Chocolates Included). Tic Tac Labels come in Packs of 12 & 24 and are printed on High Resolution Sticker Vinyl. Simply Peel and Stick on Tic Tac packets of your choice. (Stickers Only No Tic Tacs Included). Cupcake Toppers come in Packs of 12 & 24 and are printed on Polypropylene, a Durable Synthetic Film which is Both WATER-PROOF & FADE-PROOF for 3 years. They have been hot glued to Premium Food grade Toothpicks and sealed in a Snap lock bag for Hygiene. This Listing is only for my Time & Creative Service to produce your Item. This item is NOT a Licensed product and all Images have been Illustrated on behalf of Katie J Design & Events. I do not claim ownership over the Characters used. Please send me a Message if you have any Questions. Katie J Design & Events. The item "TIGGER Birthday Party Decorations Scene Setter WINNIE the POOH Tiger" is in sale since Thursday, October 15, 2015. This item is in the category "Home & Garden\Parties, Occasions\Balloons, Decorations". The seller is "katiej_84" and is located in Beenleigh. This item can be shipped to Australia, United States, United Kingdom, Canada, New Zealand.